Piano Concerto No. 2; Cinq Morceaux de fantaisie for solo piano; Vocalise for piano and voice; Pieces for six hands. 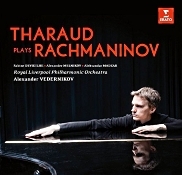 Alexandre Tharaud, piano; Alexander Vedernikov, Royal Liverpool Philharmonic Orchestra. Erato 019029595469. 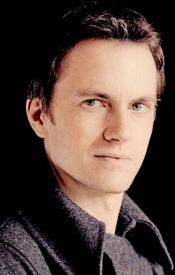 French concert pianist Alexandre Tharaud (b. 1968) is one of a growing number of fine, younger pianists who have developed almost fanatical followings in the past decade or two. The several dozen albums Tharaud has produced bear testament to his popularity, and the present one in which he plays the Rachmaninov Second Piano Concerto should do nothing to dispel his acclaim. The Piano Concerto No. 2 in C minor, Op. 18, premiered by Russian composer and pianist Sergei Rachmaninov (1873-1943) in 1901, is one of the last of the great Romantic concertos. Well, OK, not really the last; that would probably be the composer's Third Piano Concerto. But the Second, with its grand, rhapsodic gestures epitomizes the Romantic tradition, so, close enough. The history of the concerto is well known. Rachmaninov wrote it after recovering from a fit of depression brought on by the relative failure of his First Symphony and some severe complications in his personal life. As the story goes, it was only through hypnotherapy that he reestablished and revived his career. The Concerto would appear the perfect vehicle for the creative and energetic Tharaud. Can one play the Second Concerto too Romantically? Tharaud seems to try, although I don't mean this as a bad thing. He plays with an assured calm and a sweet lyrical flourish. There is little overstatement in the performance, except perhaps to keep the music as smoothly polished as possible. Furthermore, Tharaud plays with a confident dexterity, and the Liverpool players give him a solid backup, without overwhelming him in the bigger sections of the score. Tharaud's interpretation of the central Adagio glides along as tranquilly as we might expect from hearing a similar treatment of the first movement, with no inordinate surprises. It's quite lovely, in fact, even if it seems a little too leisurely and measured at times. Then, in the final movement we get a healthy but again not overheated influx of adrenaline. Indeed, the listener may find this either refreshing or too tame, take your choice. The question remains, though, how Tharaud's performance stacks up against great recordings of the past, ones from Ashkenazy, Janis, Horowitz, Richter, Wild, even Rachmaninov himself. Here, the case for Tharaud is not quite so compelling. In fact, a quick comparison to the composer's own version finds Tharaud lacking a good deal of potency, passion, and drama. Still, those things may not be what every listener wants, and Tharaud's gentler approach may be a good antidote to the more-melodramatic renderings we often hear. Producer, editor, and mixer Cecile Lenoir and engineer Philip Siney recorded the concerto at Liverpool Philharmonic Hall, UK in 2016 and the chamber music at Salle Colonne, Paris, in the same year. In the concerto, the piano is well out in front of orchestra. Fortunately, it sounds smoothly recorded, if a trifle soft, and the orchestra likewise, making the entire enterprise quite easy on the ears. So, while the piano appears most natural, the orchestral transparency could have been a bit more pronounced. In the smaller pieces at the end, the piano seems even more lifelike, with a tad more definition. And without a full orchestra behind it, the piano seems more realistically alive.